Going to need more than 60 Seconds to geek out about the 2015 Gramercy Picpoul from Walla Walla. Gramercy Cellars was founded in 2005 by Master Sommelier Greg Harrington and his wife, Pam. Prior to starting a winery, Harrington managed wine programs for restaurants owned by Joyce Goldstein (Square One in San Francisco), Emeril Lagasse, Stephen Hanson and Wolfgang Puck (Spago). At the time that Harrington passed his MS exam in 1996, he was 26 and the youngest person to have achieved that honor. According to Paul Gregutt, in Washington Wines, while sommelier-turned-winemaker is somewhat common in California and other parts of the world, Harrington was the first to traverse that path in Washington State. In 2006, Gramercy started a partnership with Jamie Brown of Waters Winery that eventually led to the development of Wines of Substance (later sold to Charles Smith) and 21 Grams (now owned by Doug Roskelley and Mike Tembreull, owners of TERO Estates and Flying Trout Wines). In 2008, Harrington was named by Seattle Magazine as “Best New Winemaker in Washington” and followed that up in 2014 as the magazine’s “Winemaker of the Year“. Along with Harrington, the wines of Gramercy Cellars are made by Brandon Moss who joined the winery in 2009 after stints at King Estate in Oregon, Indevin in New Zealand and Waters in Walla Walla. Gramercy started making Picpoul in 2013 because the variety was a favorite of Pam Harrington. That first vintage came from Olsen Vineyards in the Yakima Valley from a block that was scheduled to be uprooted and planted over to Grenache. The cuttings were sourced from Tablas Creek Vineyards in Paso Robles from original vines at Château Beaucastel in Châteauneuf-du-Pape. Subsequent vintages of Gramercy Picpoul have been sourced from Los Oídos Vineyards located in the Blue Mountains of Walla Walla which are managed by Ken Hart and sustainably farmed. In addition to managing Los Oídos, Hart was also involved in the planting of Ash Hollow, Nicholas Cole, Pepper Bridge and Seven Hills East vineyards and today helps manage the vineyards of Abeja, àMaurice, Dunham and Walla Walla Vintners. According to Jancis Robinson’s Wine Grapes, the first mention of Picpoul (or Piquepoul) was of the black skin variant in 1384 near Toulouse in the Occitanie region that borders Spain. The name is believed to have been derived from the Oc dialect words picapol or picpol which loosely translates to a “place with a peak” and may refer to the cliff-side vineyards where the grape was planted. The first account that explicitly described the white skin mutation of Picpoul was in 1667. There is also a pink-skin Picpoul gris that is nearly extinct. All three color variants are part of the 22 grapes that are authorized to be grown in Châteauneuf-du-Pape. A Picpoul de Pinet from the Languedoc. 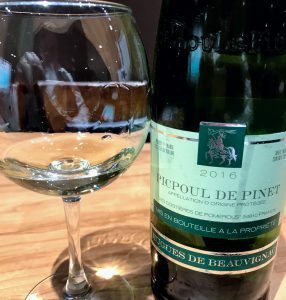 In 2009, there was over 3500 acres of Picpoul blanc planted in France–mostly in the Languedoc area where it is the notable variety of Picpoul de Pinet–the largest white wine producing AOC in the Languedoc. The grape is valued in the white wines of the Languedoc and Provence for its high acidity and lemon, floral aromatics. In the United States, Tablas Creek was the first to plant Picpoul blanc in 2000. In California, Tablas Creek has noted that the variety is early budding but late ripening and tends to produce rich tropical fruits along with its trademark “lip stinging” acidity. Several producers in Paso Robles will occasional produce bottlings of Picpoul blanc including–Adelaida Cellars, Denner Winery, Derby Wine Estates, Halter Ranch, Lone Madrone, Bending Branch Winery and Broc Cellars. Outside of Paso Robles, the grape can also be found in Calaveras County where Twisted Oak Winery and Forlorn Hope make varietal examples as well as in the Arroyo Seco AVA of Monterrey County which supplies Picpoul for Bonny Doon. In Arizona, Cimarron Vineyard in Cochise County is growing Picpoul blanc for Sand-Reckoner Winery and in the McLaren Vale of Australia, Picpoul blanc has been produced by Coriole Vineyards since 2015. In Washington, outside of the Los Oídos Vineyards supplying Gramercy, the grape is being grown at Boushey Vineyards, Corliss Estate’s Blue Mountain Vineyard in Walla Walla and at Tanjuli Winery’s estate vineyard in the Rattlesnake Hills AVA. 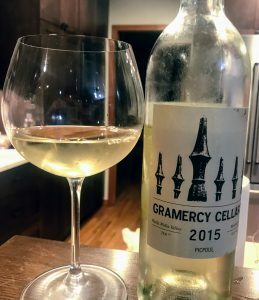 The lemon custard aromatics and creaminess of this 2015 Gramercy Picpoul is just one of the many complex layers to this wine. High intensity nose. There is a lot going on here. Initially it starts out very floral and lemony with subtle pastry crust like a lemon custard tart. Underneath the lemon zest is some dusty gravel mineral notes. In a blind tasting, this would have my brain start thinking white Bordeaux. There is also a white floral note in the background that is not very defined. But on the palate the wine switches gears and starts getting more tree fruit oriented with spicy d’Anjou pears and the floral notes morphing more into lemon verbena. The custard note from the nose carries through adding a richness to the mouthfeel–creamy but not buttery like a California Chardonnay. Even with this weighty creaminess the high acidity is quite present, offering exquisite balance and freshness. The gravel mineral notes come through and have a “crushed rock” element that is almost electric. The long finish brings a subtle hint of hazelnut that would have me wondering in a blind tasting if this was a village level Meursault. Incredibly complex wine that jumps out of the glass and leaves a lasting impression on the palate. At around $20 bucks this is an absolute steal for all that this wine delivers. But even if you can’t find a bottle of Gramercy’s Picpoul, do yourself a favor and find any bottle of Picpoul to try. If you are looking to trade out from your same ole, same ole Sauvignon blanc and Pinot gris, this grape is perfect. Picpoul has the freshness and zip of a great Sauvignon blanc but with some of the spice of Gruner Veltliner and depth of a well made Chardonnay. Examples from Picpoul de Pinet can be had for $10-13 and are often far superior to what you usually find among Sauvignon blanc, Pinot gris/grigio and Chardonnay in the under $15 category. This is definitely a grape that should be high on any wine geek’s list to try. Tagged 21 Grams, Abeja, Adelaida Cellars, àMaurice, Arizona wine, Arroyo Seco AVA, Ash Hollow, Australia wine, Bending Branch Winery, Blue Mountain Vineyard, Bonny Doon, Boushey Vineyard, Brandon Moss, Broc Cellars, Calaveras County, California wine, Chardonnay, Charles Smith, Chateau Beaucastel, Châteauneuf-du-Pape, Cimarron Vineyard, Cochise County, Coriole Vineyards, Corliss Estate, Denner Winery, Derby Wine Estates, Doug Roskelley, Dunham Cellars, Emeril Lagasse, Flying Trout Wines, Fornlorn Hope, Gramercy Cellars, Greg Harrington, Grenache, Grüner Veltliner, Halter Ranch, Indevin, Jamie Brown, Jancis Robinson, Joyce Goldstein, Ken Hart, King Estate, Languedoc wine, Lone Madrone, Los Oídos Vineyards, Master Sommelier, McLaren Vale, Meursault, Mike Tembreull, Monterrey County, Nicholas Cole, Occitanie region, Olsen Vineyards, Paso Robles, Paul Gregutt, Pepper Bridge Vineyard, Picpoul, Picpoul de Pinet, Pinot grigio, Pinot gris, Rattlesnake Hills AVA, Sand-Reckoner Winery, Sauvignon blanc, Seattle Magazine, Seven Hills Vineyard, Stephen Hanson, Sustainable Viticulture, Tablas Creek, Tanjuli Winery, TERO Estates, Twisted Oak Winery, Walla Walla, Walla Walla Vintners, Washington Wines and Wineries, Waters Winery, Wine Grapes, Wines of Substance, Wolfgang Puck, Yakima Valley.